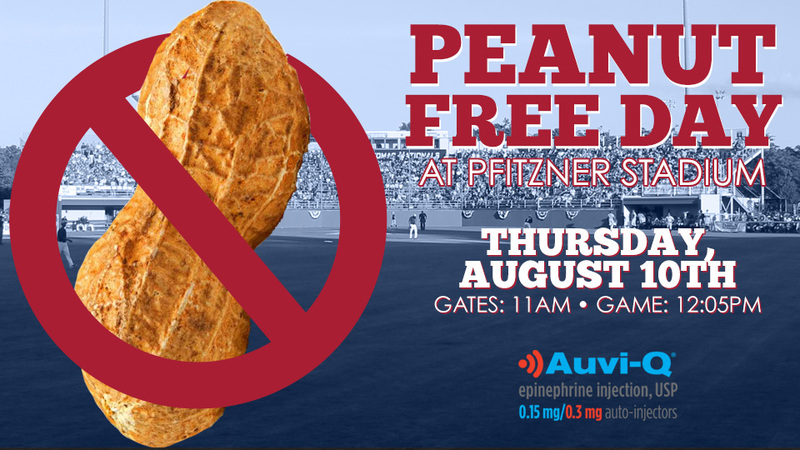 Woodbridge, VA---In conjunction with Minor League Baseball and AUVI-Q, the Potomac Nationals are excited to announce a "Peanut-Free Day" at Pfitzner Stadium on Thursday, August 10th. The game between the P-Nats and Myrtle Beach Pelicans (Chicago Cubs) will help fans that suffer from peanut allergies enjoy America's national pastime with less concern. Per the release here from Minor League Baseball, AUVI-Q has been named the "Official Epinephrine Auto-Injector (EAI) of Minor League Baseball. The partnership includes participating clubs, including the Potomac Nationals, hosting peanut-free games at their respective ballpark. On "Peanut-Free Day" at Pfitzner Stadium, 8/10/17, gates will open at 11:00am, while first pitch is scheduled for 12:05pm. NOTE: Although the Potomac Nationals have made every effort to remove peanut shells from areas of Pfitzner Stadium accessible to fans, and despite the P-Nats prohibiting the sale of peanuts at concessions areas within The Pfitz on Peanut-Free Day, P-Nats Baseball cannot fully guarantee peanuts or products containing peanuts haven't potentially come in contact with other products sold at Pfitzner Stadium or areas of the P-Nats' ballpark on Peanut-Free Day. However, Auvi-Q epinephrine auto-injectors will be on site to assist with any peanut allergy-related incidents. The Potomac Nationals of the Carolina League play at Pfitzner Stadium in Woodbridge, Virginia, and are the Carolina League affiliate of the Washington Nationals. The Potomac Nationals have claimed five Carolina League Championship titles (1982, 1989, 2008, 2010, and 2014) and nine CL Northern Division Championships. Sponsorship opportunities for the P-Nats' 2017 season and beyond are available, as well as all-inclusive corporate outings to watch the future stars of the Washington Nationals at The Pfitz. For more information on Potomac Nationals 2017 single game tickets, season tickets, mini plans, group outings, and picnic packages, visit the P-Nats online at www.potomacnationals.com or call the Potomac Nationals' Extreme Custom Collision Ticket Office at 703-590-2311.